Papi’s Tacos at Seah Street is both a hole-in-the-wall and not. Not because any eateries along prime land Seah Street shouldn’t be considered a hole-in-the-wall; but it can be considered as one because it is small and unpretentious. Because it is so small, so narrow, allowing no more than 36 people, the taqueria fills up quickly. By 7pm on the Thursday we were there, it was full house with mostly expats and after-work executives. (Hey what happens to OT?) The joint was playing swing music and upbeat 60s songs; people were drinking; the atmosphere was–to use Singlish–damn happening. 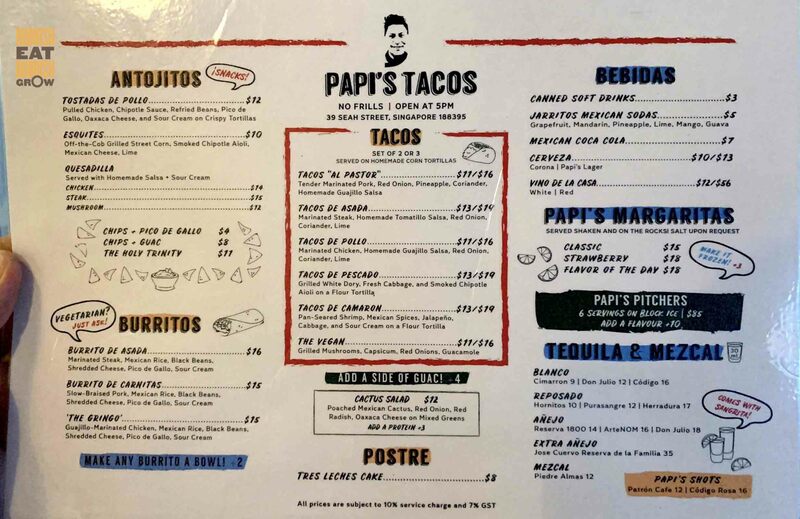 Papi’s Tacos is opened by Chef Mauricio Espinoza who comes from Papalotla, the southern part of Mexico. He used to work at Employees Only in Singapore and in New York. Almost everything here is made by hand (except the flour tortillas). He also makes five different hot sauces (with varying level of spice from 1 to 5) for customers to add to their food themselves. The esquites ($10, grilled corn which is a Mexican street food) here are already scraped off the cob, and mixed with smoked chipotle aioli, Mexican cheese, and lime. It’s not bad but compared to Super Loco’s version which comes as a whole corn, it pales. It is not as rich or smokey. Perhaps it is the fun of eating from the cob that is missing here. The pico de gallo (which is just a tomato-based salsa) adds a variety and is refreshing. They have buritos and quesadilla but we came for the tacos, which comes in twos or threes. Good thing first: you can tell that they make their own corn tortillas from masa harina (a Mexican corn dough) by the irregular shape. It’s still mealy and has a nice rough texture. Bad thing: they are tiny and really expensive at $11 for two. We tried three: tacos al pastor (pork, $11 for 2 / $16 for 3), tacos de asada (beef, $13/$19), and tacos de pollo (chicken, $11/$15). They are all good. The best is the chicken with homemade guajilo salasa, red onion, coriander, and lime; best because every ingredient interacts well and provides a layering of flavours. One last recommendation is their frozen margaritas. The strawberry margarita ($21) is really expensive but very easy to drink and super tasty. But be careful, it is loaded with alcohol. It was so tasty that I drank quickly and was heady and drank at half a glass. We didn’t expect to pay so much at a casual joint like this: $97 for two persons. But the food is complex and flavourful and the atmosphere was jumping. A really fun place. We enjoyed ourselves immensely.